Something that you may find interesting is that I usually don’t get the opportunity to actually *play* with our new stamps until the week of the countdown. I had anticipated the introduction of Guide Lines to be one of the simplest tutorials to offer up this week, but as I sat down to really USE the set, in all it’s glory, I found that there are actually MORE ways to use it than originally intended. And I have a very good feeling that this is just the tip of the iceberg! First a few basics about this background building set. The premise of Guide Lines was inspired by my love of building backgrounds and the "grid" that I sometimes draw in pencil to help align the images accurately. A lot of thought was put into the design of the large grid image included with this set, so you can add to it and have it cover a large area easily. The grid measures 2.25 x 4.5 inches and was designed to fit perfectly on our large gridline block. 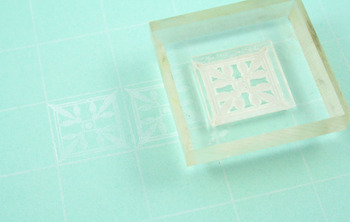 The grid pattern features two closed ends and two open ends. This allows you to build a grid above & beside itself with ease. Here is an example of how I found it easiest to line up multiple impressions of the grid. 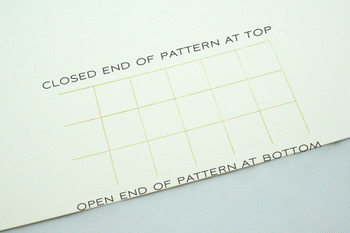 When you begin, always stamp with the closed end of the pattern at the top and the open end of the pattern at the bottom. When you add to your image, be sure to keep the same orientation, with the open end of the pattern at the bottom and the closed end of the pattern at the top. I found it best to look down through the block and focus on the actual lines matching up, rather than the overall block. 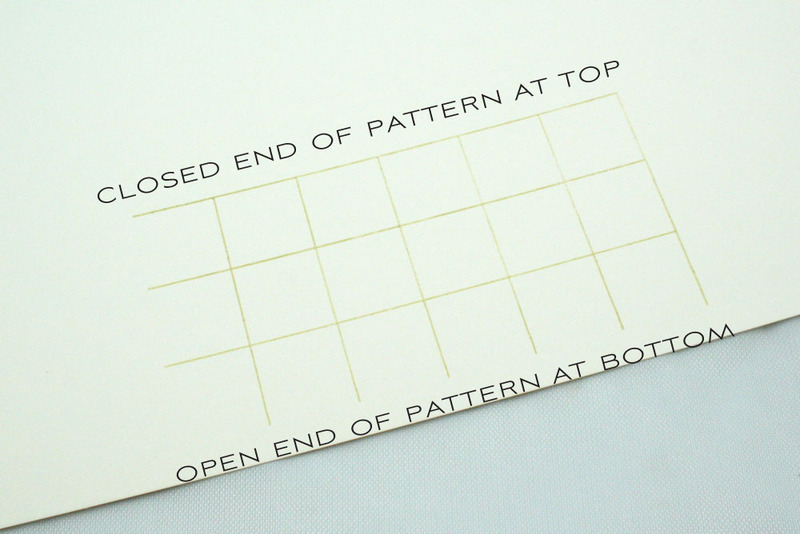 When you get your set, I encourage you to practice on some scratch paper first to get a feel for the alignment. I am certain that after two or three trial runs, you will find it to be almost effortless! 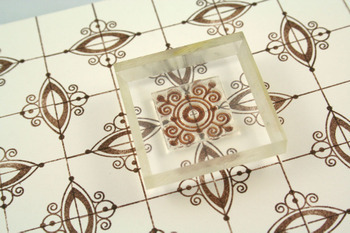 There are a total of nine decorative elements that are included in this $15 set, that are perfectly sized to coordinate with the grid. A lot of effort went into each of these small images, ensuring that they were geometrically even & centered and that they had special reference points built into the design. Here is an example of the first element. (You can click to enlarge) Notice the reference points I mentioned above? I found it easiest to always line the center up first, followed by the outer reference points that fall onto the grid lines. 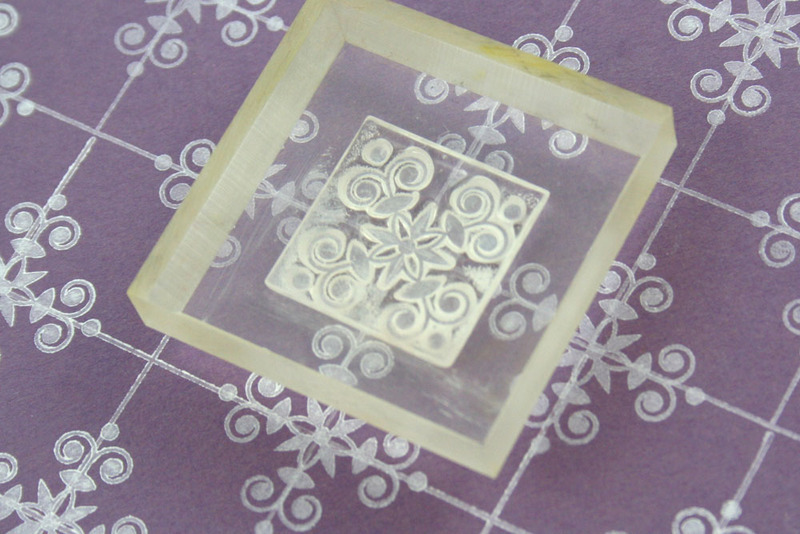 After stamping the decorative element at each intersection, I am left with a BEAUTIFUL background. And the ability to recreate it as many times as I like, in any color I desire! 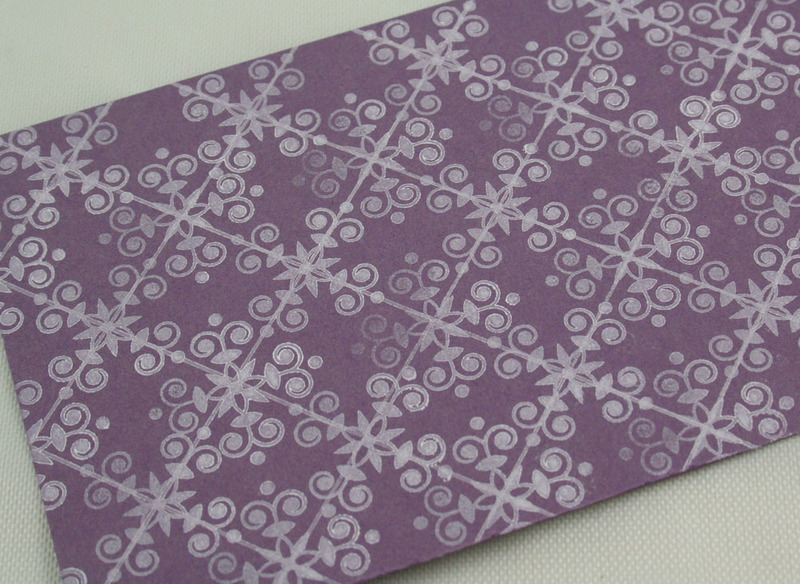 Here is a simple little card that I made with my custom paper! Here is another example of building on the intersections of each grid. Notice the special reference points that make it so easy to line up. One fun thing to keep in mind when creating papers with this set, is all of the fun things you can do to embellish the intersection of the grid. Here I have used small dabs of Stickles. You could also stitch on beads, add small dots of liquid pearls, rhinestones, mini brads. You can even stitch or do piercing along the guidelines for even more emphasis of your pattern. 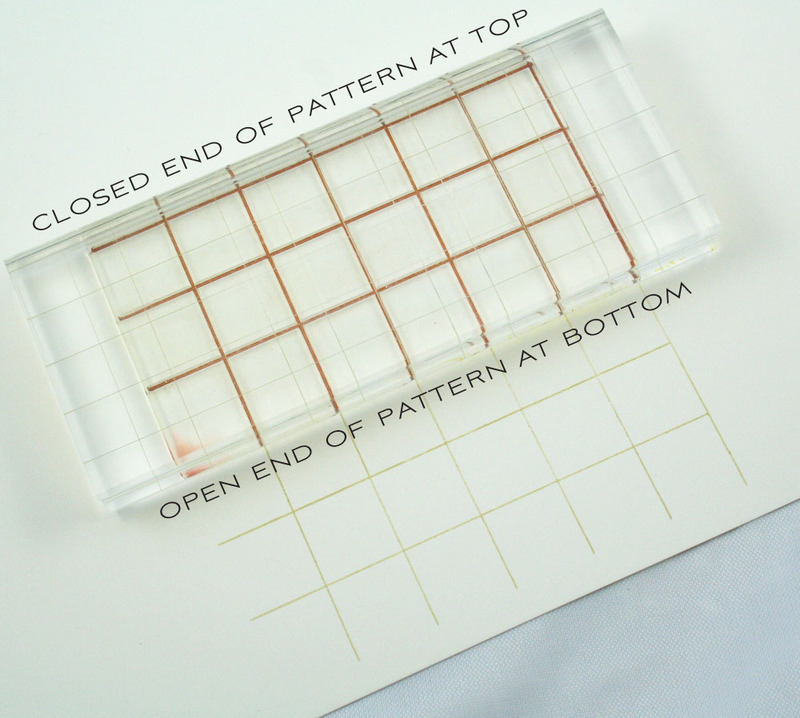 Another thing to keep in mind when using this set is that you don’t have to limit yourself to using just ONE decorative element within your pattern. You can mix it up for even more possibilities. Here, I have started with my first chosen design. Once again, notice the reference points in the center and ends, making it easy to position exactly where I want to. Always remember that sometimes you can rotate the image while building to get a variety of looks. As you can see here, I hove completed the first step of my design, with some of the elements going horizontally and some vertically. Now I am adding my second design element. Because of the precision I used with designing each of the elements, you can see here that this addition nestles in perfectly within the opening. Here is my completed pattern. 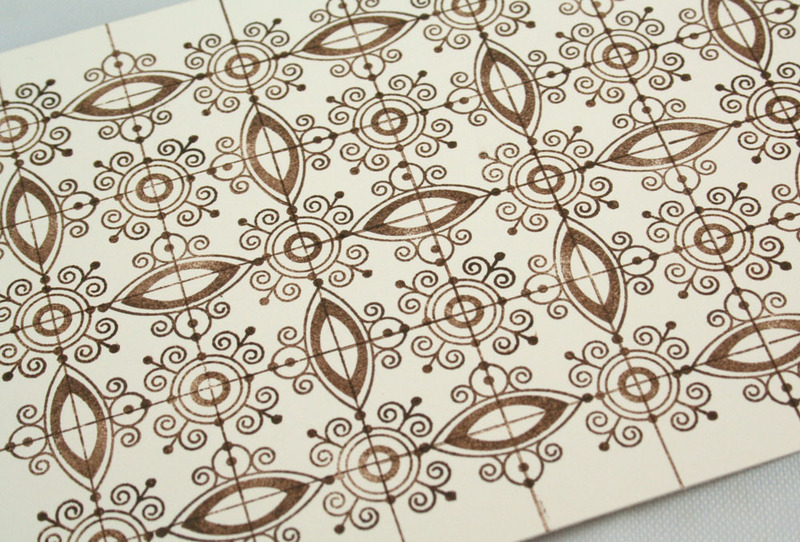 I just LOVE how easy the guidelines make it to create perfectly straight, symmetrical patterns. And I know you will love it too! 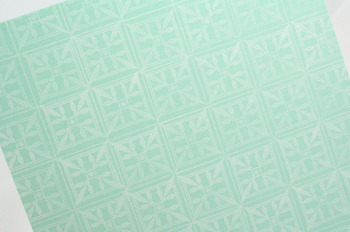 For a whole new mix on things, you can also stamp the design elements directly within the boundaries of each grid square. Albeit, this method as not as easy to do as the techniques described above, but the results are just as fabulous. Concentrate on the placement of your four corners and you should be able to build a pattern almost effortlessly. Here is my finished product. Notice that it is a completely different look than that which you get when utilizing the intersections. 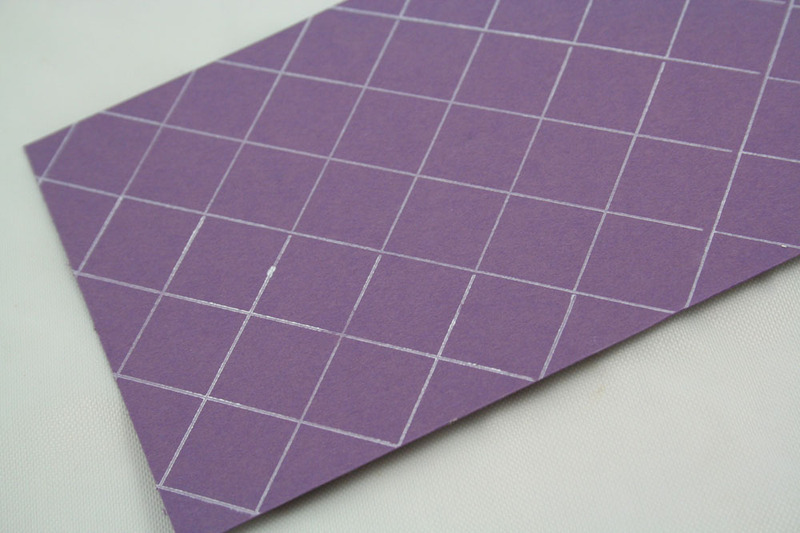 Another fun way to use this set is to actually use the grid at a diagonal. (Heather did this today too). I found that the best thing to do is align the corners of the intersections at the edge of your cardstock and build from there. 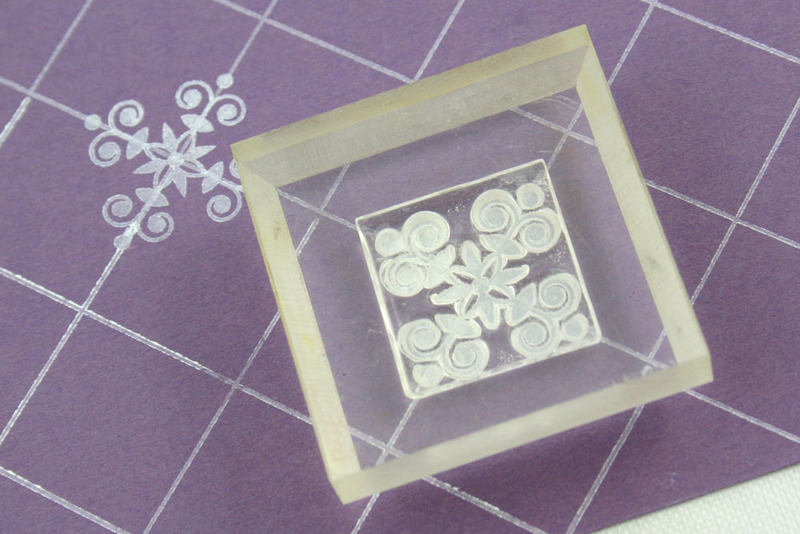 This will ensure that you will have your diagonal intersection perfectly vertical so that they look like diamonds. After you have created your guidelines, you can begin building your pattern. I started with this element first in a horizontal orientation at every other intersection. I then rotated the image and filled in the remaining intersections. Here is what the pattern looks like with just a few of these intersections filled in so you can get a bit more of a feel for how the pattern was built. And here is the completed pattern. 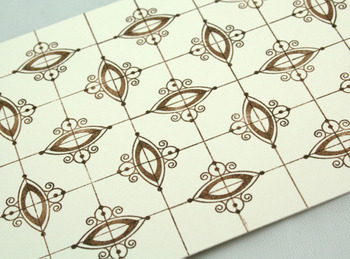 I loved this specific combination because of the way the pattern appears to be climbing along each of the grid lines. I am still in awe of how each and every combination looks completely different than the last! the grid can be used by itself as a simple background, with a horizontal orientation or diagonal. you can try using some of your favorite small images from other sets within the grid to build even more patterns! if you don’t want the guidelines as prominent in your design, you can do the in a lighter shade of your main color. 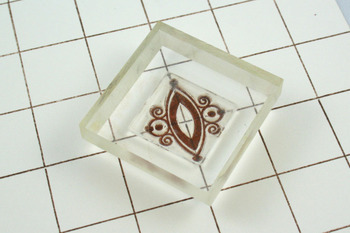 the decorative squares can not only be used to build patterns, but as focal points as well. all of the decorative squares coordinate with a 3/4-inch square punch. 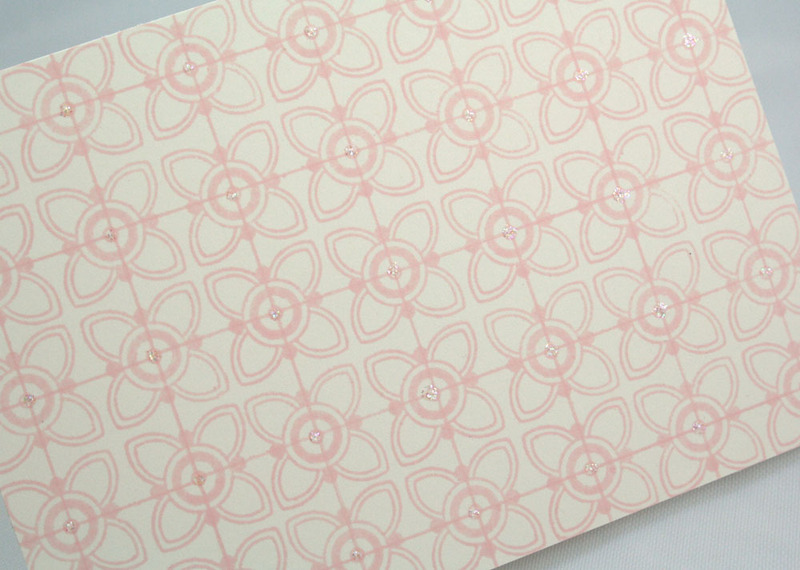 you can add punched elements to the grid for a textural pattern. 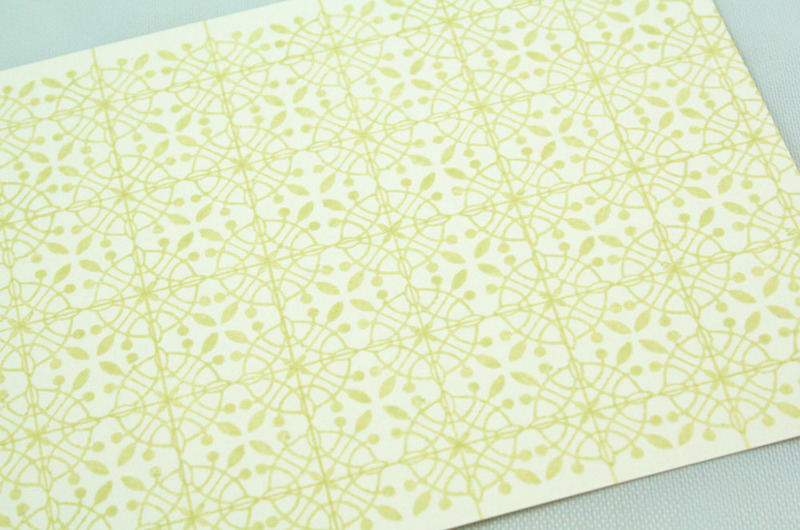 your pattern doesn’t have to be monochromatic. Try doing different elements in various colors. Well, I think I have bombarded you with enough info on this set for one day! I still have a few more things I would like to share with you, but I will hold off until later in the week! Have a happy Wednesday! –Heather Nichols is featuring a project today that uses Guide Lines as well. –Lisa Johnson shows you some innovations she built into her first stamp set releasing this month. –Candice Aguilar gives you a little sneak peek into what her set is offering up too. Ink: Aqua Mist & Burnt Umber Palette, white craft from SU! 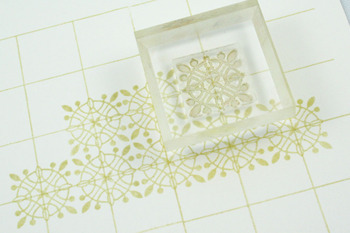 Ink: white craft from SU! This month is going to be an expensive month… Love ALL the set that are being release. Absolutely FABULOUS! Pure genius…love love love it. The ideas are already rolling in my head. Thanks for this detailed post Nichole. I know between the projects and the upload it was very time consuming! WOW! This set is so amazing! Everytime I try to convince myself that next month I won’t need everything, I come here and get blown away and of course…..I NEED IT ALL! I love, love, love this set! This is definately on my must have list! Awesome, versatile set and beautiful samples! definitely on my must-have list! How fun! How do we hurry up the 15th? I’m ready to buy, buy, buy! OMGoodness! I love them all! The set is even more versatile than I anticipated! Can not wait to get it and start playing!!! Whoa … that’s all I can say … Whoa. I am so excited over this set. I have just begun to think of the possibilities. One that comes to mind, is for those of us who want all the new tools but can’t always justify them, I can disregard bying the scorpal at this time. 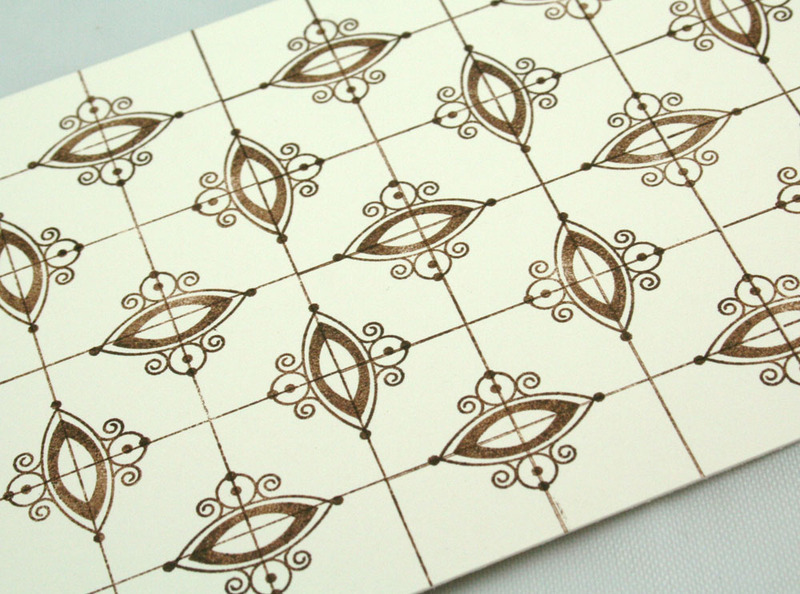 If I stamp the grid on the back of the paper, use a ruler, mousepad and stylus, I should be able to have a beautiful embossed panel for my card. This set is perfect! Can’t wait to order. I LOVE it!!!! I must have it!!!! I love the way your brain works! LOL! 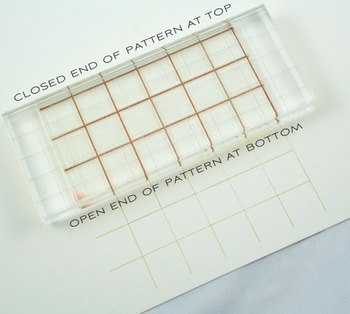 It’s a fantastic idea, perfect for those of us without the gift of having perfect alignment! 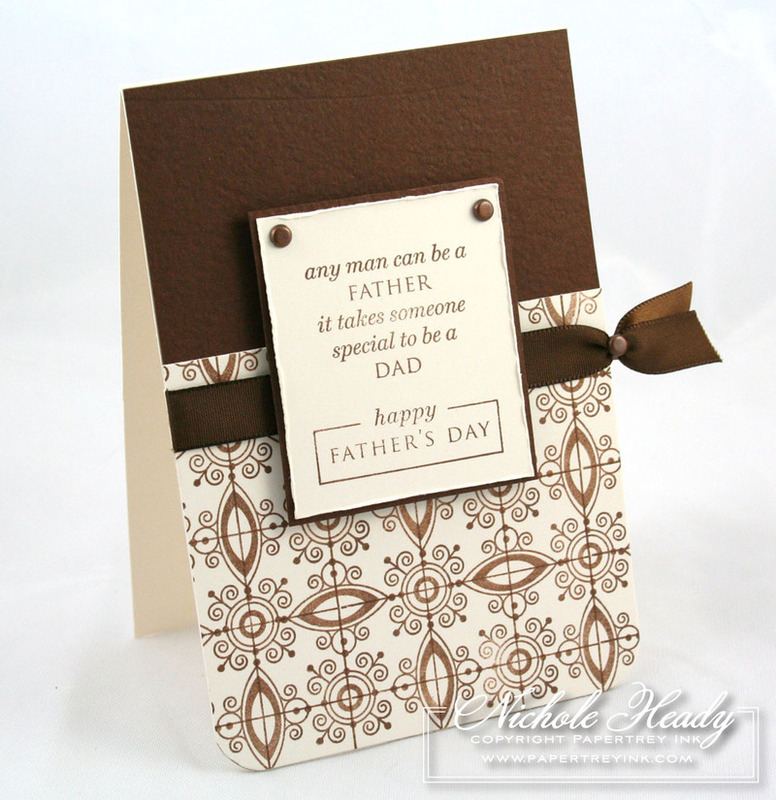 I especially love the brown and cream Father’s Day card. I can hardly wait!!!!! I LOVE this set!!!!!!! i LOVE it! what’s more convenient than customizing your own patterned paper? only four more days… can’t wait! Wow, wow, wow. I absolutely love this. So many possibilities! Wonderful cards and great presentation of different ways to use this set. This is the most amazing set ever! That is what’s so great about PTI–such versatility. I am so excited about the possibilities…..
Whoa! That system is so cool! And innovative! Congratulations! I echo Kacey: I’m in soooo much trouble this month! I think I’m going to be hitting that evil “I want it all” button! Just when I think “what else could she possibly come up with?” you top yourself. Great job! OMG – This is one set that I will definately be buying!! The samples are amazing and the instructions are fantastic!! I CANNOT wait to get this into my hot little hands…..You know they could also be used for? Paper piecing. 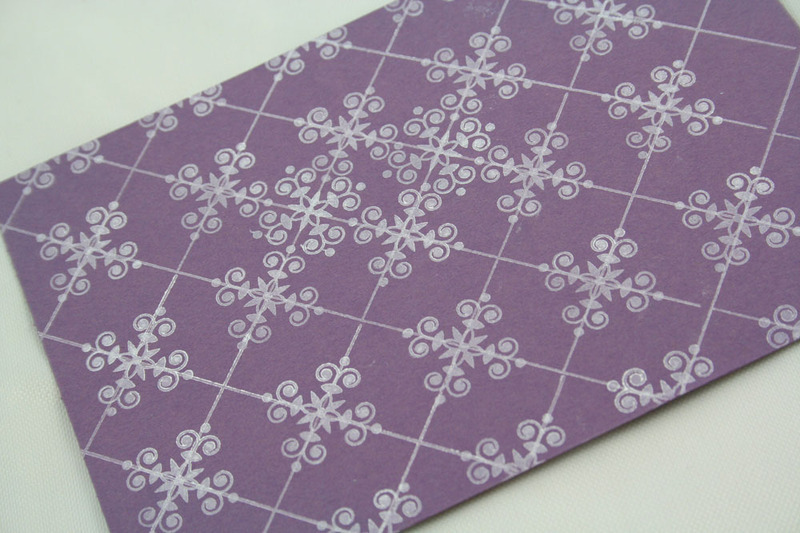 You can make your own paper and then stamp other images for paper piecing! I cannot tell you how happy I am to have found your blog and PTI!! PTI FOREVER!!! Oh my gosh! I can’t wait for June 15!!! It’s gonna be a really expensive month for me. I’m going nuts about PTI stamps! I’m already in love with this set- I have spent the last month playing almost exclusively with the PTI anniversary set to build pattern papers and it’s been so much fun. Now I’ll have another set to coordinate with it!! Wahoo. WOW gorgeous samples. I really need this set! You are brilliant, and I am in awe! I am LOVING all of your samples and need to take just a moment to pick my chin up off the floor… Looking forward to the rest of the release! Good thing I have my bday stash to spend, I so love this concept for the BG it is amazing. Very nice job on all of the cards you have shown today, they are all wonderful! MUST HAVE… is there really anything else to say… oh yeah… WOW! This is such a great, versatile idea. I love all the possibilities! Oh my, oh my!!! I think this is going to be the best stamp set ever!!! I must say you have outdone yourself with this set. I can see so many possiblities and love it. I can’t wait until Saturday night when I can see all the sets. This set looks like another must have for me. Are these already released? I would love to have this set. Things that are this versatile are a must have. I am new here so some guidance will be so appreciated. WOWW WOWW WOWW, All your cards are so pretty!!!! The stamps are so different than others, your creations are amazing. What an AWESOME idea for a stamp set! I can’t wait to play with it! The outcomes are endless!!! I love all of your sneak peaks so far, and can’t wait to get my hands on them! Thank you thank you!! Holy Cow!! 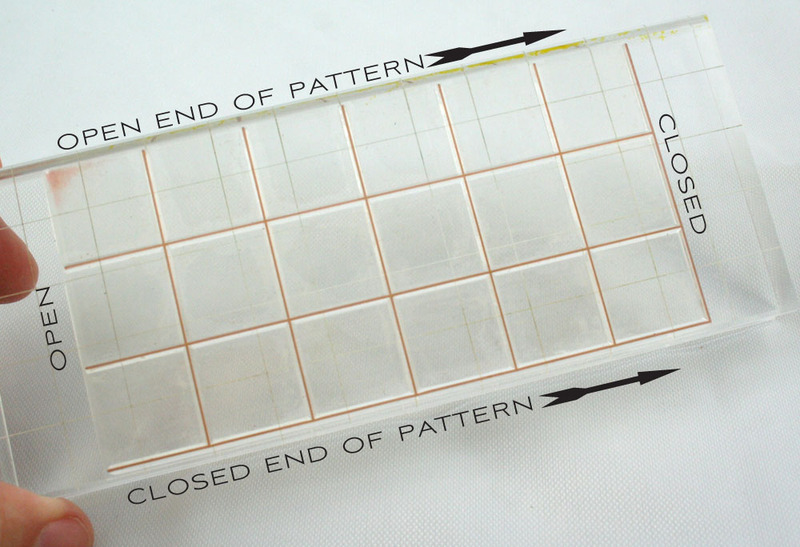 I’ve always been amazed at your patterned papers and never thought I’d be able to manage that on my own… the grid will make a world of difference!! OMG You are so clever! I’ve been contemplating making a purchase. This set has sealed the deal. When can I purchase it? I’ve looked online and can’t find it. WOW! am i in trouble this month!! totally awesome !!!! Nichole, this is not great or super or wonderful….those words are so so small….this is honestly and with all my heart, in my opinion….GENIUS!!!! And you and your team deserve awards. Honestly. This is tremendous…and the price?? Astounding. It WILL be on my next PTI order…if there are any left when I order! Goodness. Well done!! Oh Boy, Oh Boy! I love it, I love it! You have totally sold me on the background set!! WOW!! I am in love!!! Cant wait until the weekend!! Love it. Looks like a disappearing inkpad needs to exist!! Nichole, every month I say, “Over the top”! You have done it again! You have thought of every single, small detail. I can’t wait to play with it. You are such a fresh breath of creative air. Thank you. I am blown away. TOTALLY blown away! That you can turn simple lines into such beauty. This set will be one of my most used, I just know it. i haven’t really felt the *need* to buy one of the PTI sets when they are just released, but i NEED this one – it’s incredible. thank you for the sneak peak! 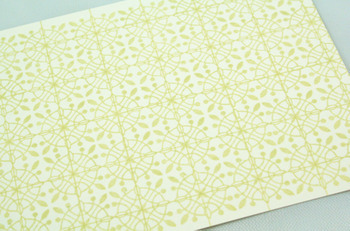 Nichole, I am SO excited to see this set, do you know how long I’ve waited to be able to stamp backgrounds as well as you do? You’ve made it so easy now! Thank you!!! Brilliant! I have to have this set. LOVE IT! Whoa! 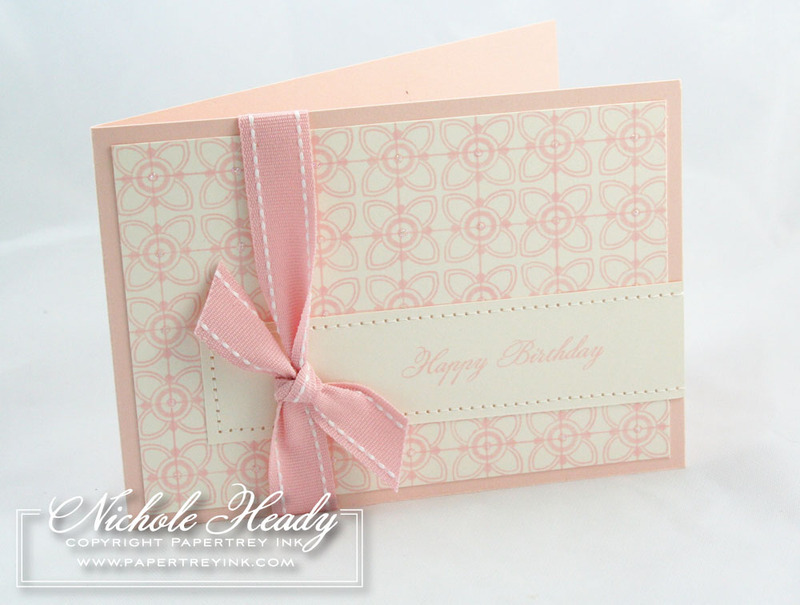 What an awesome set…and the post is wonderful, Nichole! I am so impressed with this amazing set. Can’t wait! All your posts have great tutorials and gorgeous cards!!! 🙂 I’m drooling..
Amazing. The pink birthday card is my absolute favorite! This set is amazing…I can’t wait to get it into my hot little hands! Yikes! this grid stamp is terrific! and your samples are delicious! This looks wonderful. You do such an awesome job of demonstrating the versatility of the stamps. I’ll be on the look out for this stamp set. Thanks for all of the tips. I can hardly wait for this set! I love, love, love it! Thank you for creating something that is so wonderful! 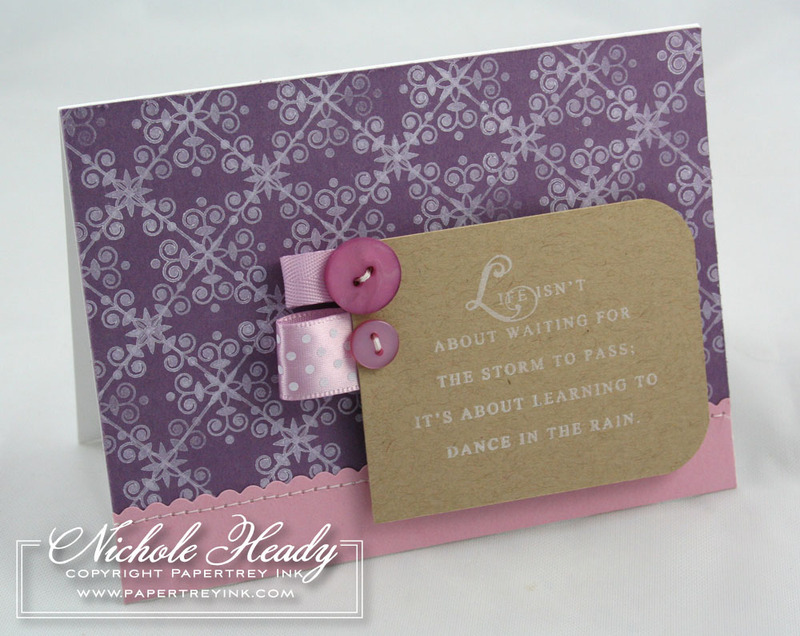 You put so much thought and beauty into all of your creations and then share it with the stamping world. Just amazing! Thank you! 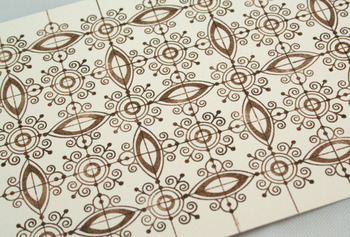 I told you I love repeating elements. A woman after my own heart… gridlines? reference/registration marks? Your analytical thinking combined with your artistry is pure GENIUS! Put it in a format my scientist brain will “get” and you’ll make an artist out of me yet… Thank you, thank you, thank you!!! You deserve every ounce of success coming your way, Nichole. WOW! I can’t wait to get my hands on this set. You’ve done it again, Nichole! Oh my goodness; this set is sooooo intriguing! It’s definitely a MUST HAVE! My friend, Gwen, has been raving about your products & now I MUST buy this one for my first!!! Can’t wait! Hmmmmm, maybe I’ll be lucky right after Fri. the 13th & WIN something!!! 😉 Gotta love that possibility! “See you” Saturday night!!! Thanks for the awesome peeks!!! This is a really great idea! I love it! I just love your work. I tried looking for this set with nine elements + the guide lines to purchase from your site and I couldn’t find it. Please!!!!! Where can I buy it (online)????? Thanks for your help and always inspiring work! Nichole, you are the BOMB. Where have these been all my life? I’ve just gotta have them! Hello: I have just been led to your blog and I have to tell you it is magnificent. I have been off and on it every coffee break and lunch hour all week and I am so very impressed. Not only with your projects but your wonderful way of presenting them and explaining the projects. I have found a new place to roost. Thanks for all you do.